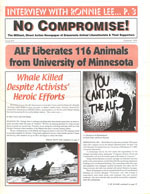 If I had to create a list of my favorite years in animal and earth liberation history, 1999 would be in the top 5. As the movement looked towards the new millennium there seemed to be an intense urgency in the air, perhaps people felt the need to close the 20th century with a bang or leave their mark before the world ended in a technological melt down on Y2K! Whatever the reasons, direct action reached a fever pitch. 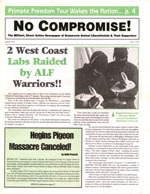 Lab raids returned to the United States, the Earth Liberation Front continued it’s ascendancy, Hillgrove farm was shut forever, and everyone seemed to be preparing for the World Trade Organization ministerial in Seattle. 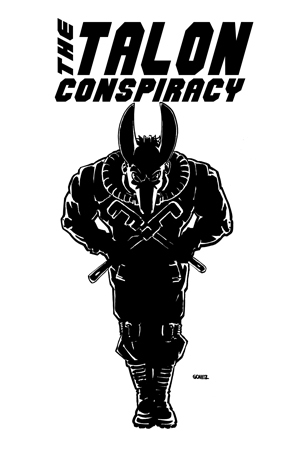 Across the globe there was a sense that people were not going to take it anymore, and whether you were struggling against bio-technology or prisons or speciesism, chances are good that you were employing some form of illegal tactic. 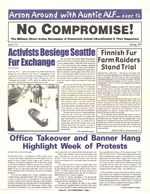 No Compromise may not have covered everything going on in the global struggle, but if it was animal lib related then chances are it was covered in these three issues. From the death of Alex Slack to end of the annual Hegins pigeon massacre, you’d be hard pressed to find a more complete overview of these twelve action packed months.